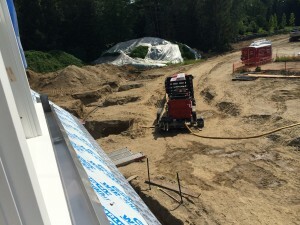 Geothermal Ground Loop Construction Completed « Air Water Energy Engineers, Inc.
July 12, 2014: The ground loop construction has been completed. This is for the geothermal HVAC system of a private residence. Collaborating with Cambridge-based architect, Gund Partnership, AWE engineered the closed-loop geothermal HVAC system for the 10,000 SF private residence in Concord, MA.